Fast Connect Fiber Optic Splice Closure M12 - Dome Fiber Optic Splice Closur - fiber optic splice closure, Heat Shrinkable Cable Joint Closure,Terminal Box. Model Fiber Optic Splice Tray Max. The closure is widely used to connect and branch optics cable fibers in aerial,pipeline and direct buried applications.Adopt mechanical sealing methods and fast connecting kits for drop cable,no need to open wihle installation.Designed with simple inner structure,easy to operate,is the best choice for netwrok construction. 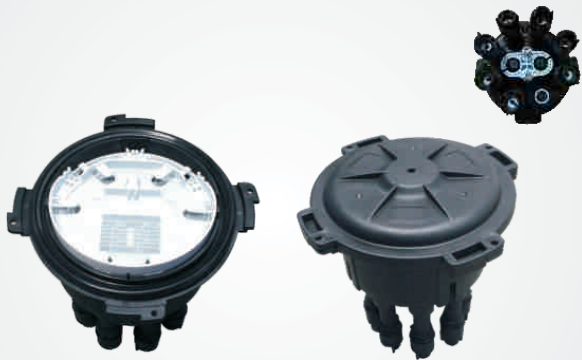 5.Equipped with sizes of cable rings,for kinds of cable diameters inlet and outlet.